Indian pudding is not a photogenic dish, but if you like pudding, you’ll probably love it. Native Americans did not make this, but they taught European settlers how to use cornmeal, a main ingredient in the pudding, along with milk and molasses. 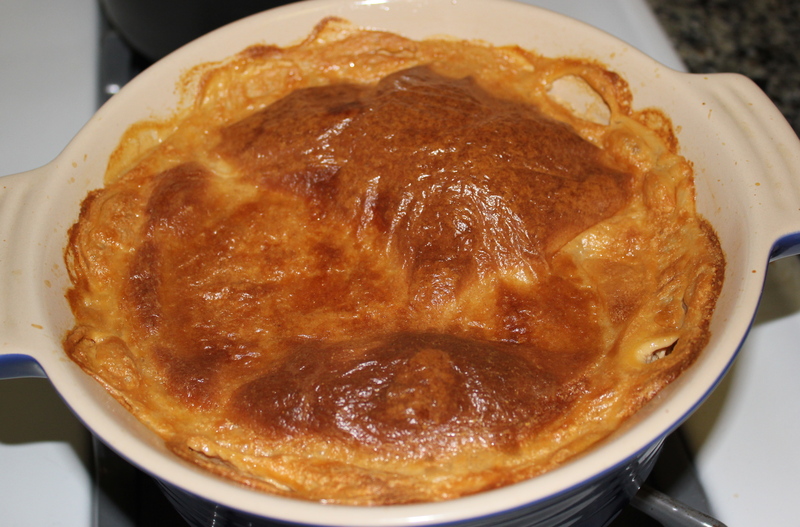 It is basically a variation on English hasty pudding using cornmeal instead of wheat flour, which was scarce in the colonies. The dish evolved over time to include spices, butter, eggs, and sometimes raisins. It is traditionally baked for hours at a low temperature. 3 pints scalded milk, 7 spoons fine Indian meal, stir well together while hot, let stand till cooled; add 7 eggs, half pound raisins, 4 ounces butter, spice and sugar, bake one and half hour. As usual, I looked for other recipes to get more detail on measurements and cooking, but the ones I ended up trying were not that different from Simmons’s. I first made Richard Sax’s adaptation, in Classic Home Desserts, of the famous Indian pudding served at Durgin-Park restaurant in Boston, and it was good but had a very strong molasses flavor. My daughter and I both preferred Betty Groff’s recipe from her Pennsylvania Dutch Cookbook, which calls for “table molasses” (such as golden, barrel, or King Syrup) instead of traditional baking molasses. I used Steen’s Cane Syrup, which is not easy to find but is so worth it. I made this pudding the day after Hurricane Sandy hit. We were lucky not to lose power, and fortunate to have good comfort food. 1. In a medium-large pot, scald 2 cups of the milk. 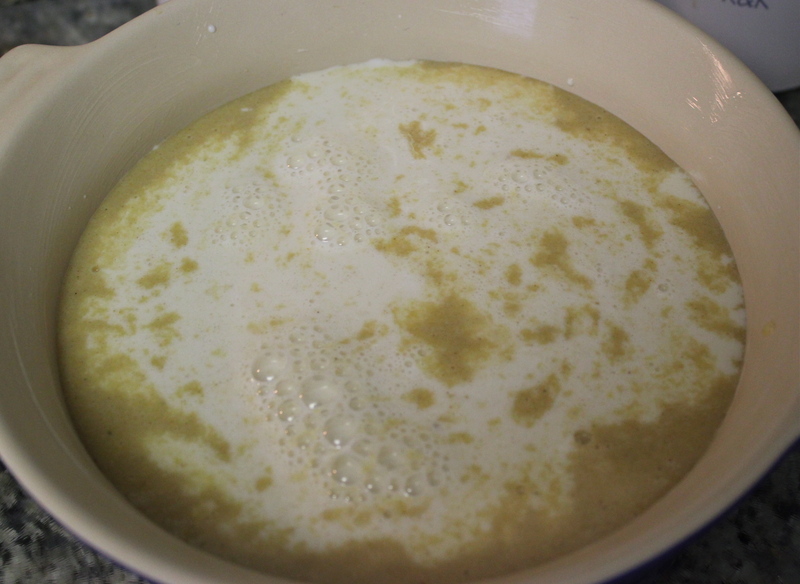 Gradually whisk the cornmeal into the hot milk, stirring constantly so that mixture is smooth. 2. Add the butter, molasses, raisins, egg, sugar, salt, ginger, and cinnamon, and mix thoroughly. Let stand until thickened, up to 5 minutes (it may happen more quickly). 4. Bake in a preheated 300°F oven for 2 to 2½ hours, until set. Serve warm, with whipped cream if desired. 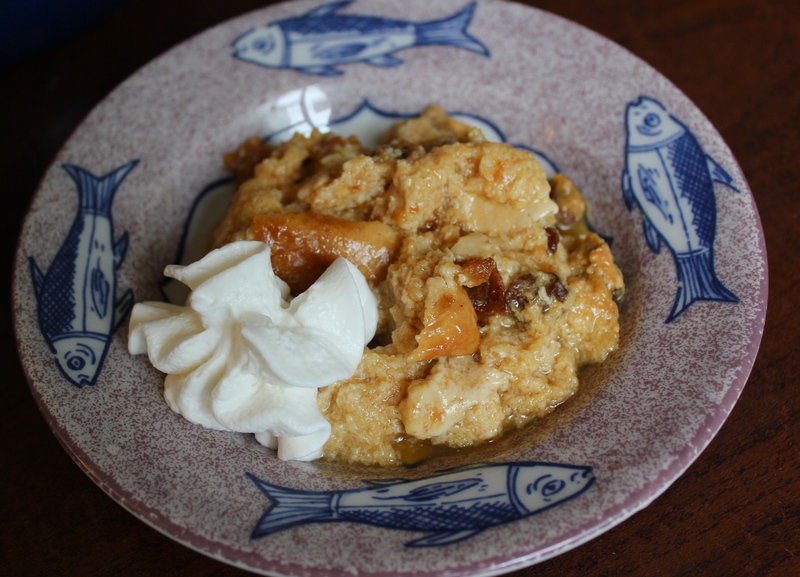 This entry was posted in puddings and tagged cornmeal, Hasty pudding, Molasses, Steen's cane syrup by revolutionarypie. Bookmark the permalink. Looks tasty, best-looking Indian Pudding I’ve ever seen!